4/20... :) just brings a smile to my face... 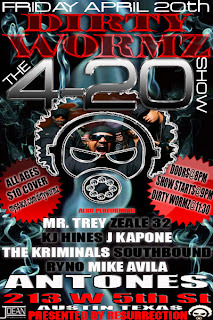 Dirty Wormz, Mr. Trey, Zeale 32, KJ Hines, J Kapone, The Kriminals, Southbound, Ryno, Mike Avila @ Antone's on April 20th. diRTy WoRMz were formulated, plotted and instigated in the year 2001. The band was the brainchild of Smackola and DJ Crash, hip hop artists who wanted to rock harder and louder than anything Austin, TX had ever seen. The legend began with the release of the first diRTy WORMz CD, The Infektion. Featuring an all star lineup from the local rock and hip hop communities, The Infektion was a regional best seller for years to come. diRTy WoRMz quickly evolved into one of the most devastating live acts in Texas, leaving scores of scorched musicians in their wake. dWz was voted Austin's Best Hip Hop act two years running, won Best Urban Video for their cover of Run-DMC's "Here We Go", and the single "Top Of The Food Chain" was the year's top local request on Austin's 101X.